St John’s Cathedral is located in Bishop Chrispian Way and was built in 1882 and replaced a chapel that had been built in 1796 in Prince George Street to the west of the current Cathedral. Before 1791 it was illegal for Catholics to have chapels in towns of Borough status. The first priest was John Cahill who had a Chapel in a private house in Unicorn Street. He was succeeded in 1794 by Joseph Knapp who opened a purpose built chapel in 1796 in Prince George Street. In 1851 the chapel was enlarged and by the 1870s an even bigger church was needed, so the land that the current Cathedral is situated on was purchased from the War Department in 1877. 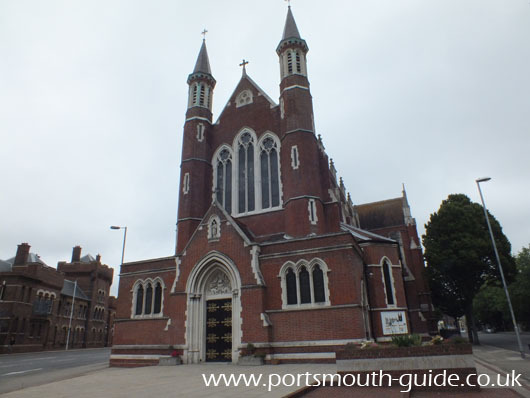 The new church was opened in August 1882 and was immediately made the Mother Church of the new Catholic Diocese of Portsmouth. The Cathedral was built in four phases: the nave was built in 1882, the crossing in 1886, the chapel in 1892, and the narthex and west Porch in 1906. In 1941 the Cathedral was badly damaged during bombing raids and the Bishop's House was destroyed. The Cathedral was restored in 1950 after the war and the inside has been re-ordered in 1970, 1982 and 2001. The Cathedral is of 19th Century French Gothic design and was designed by John Crawley to have a tall spire at the South West corner but the geology of the land made this impossible. The design was taken over by Joseph Hansom when John Crawley died. Fareham Red Brick and Portland Stone were used to build the Church.